Modern-day magicians put on spectacular magic shows in dazzling showrooms and intimate theaters in Tumon. Let yourself be mystified and thrilled by the tricks and illusions in these family-friendly shows. 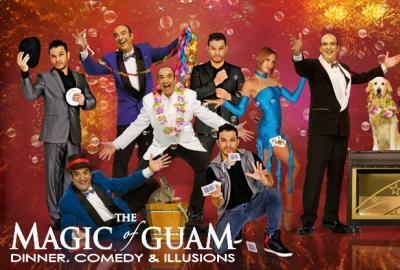 The Magic of Guam Dinner Show is a great budget-friendly option for the entire family. Hosted by Hank Rice, a comedy magician who has lived in both Guam and Japan and is a seasoned professional entertainer. Master Illusionist JD Iriarte was born on Guam and has spent the last 20 years in Hollywood, California. He has traveled the world honing his signature style of close-up street magic that has now been infused with stage illusions. This unique family-friendly show will amaze you with incredible illusions and funny comedy. There are also numerous opportunities for you or your child to be a part of the fun on stage. The dinner show includes a delicious all-you-can-eat buffet complete with dessert. The Magic Of Guam showroom seating arrangement has been specifically designed to ensure that everyone has a perfect view of the stage and performance platform. To complete your experience, the stars of the show along with some of their friendly animals will happily take pictures with you after the show. The island’s largest magic and entertainment show, DREAM, is a unique combination of grand illusions by master SandCastle magicians, Chris & Ryan. "DREAM" is produced and created by Mark Baldyga, CEO & Chairman of SandCastle, in collaboration with well-known director, Christopher Childers, who has worked with world famous shows and artists like Cirque du Soleil and Madonna. DREAM features amazing magic illusions, white tigers, beautiful dancers and more. SandCastle&apos;s recent renovations include illusionary stages, a majestic 500-seat showroom, and dynamic lighting and audio systems. From the Casual Plan to the VIP Plan, SandCastle offers various packages to suit every guest’s needs. Experience the spectacular Las Vegas style show from anywhere in the breathtaking theater. From the front row to stadium seats, you&apos;ll enjoy each exciting moment with all of your senses. Encore! 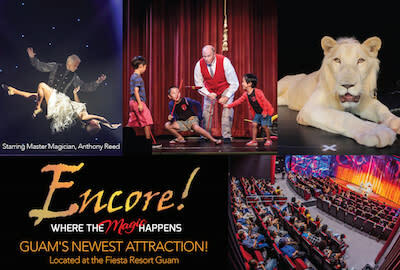 Where the Magic Happens is a brand new show housed inside a newly renovated theater at the picturesque Fiesta Resort Guam. The show features Renowned Master Magician Anthony Reed, this time teaming up with Award-winning Silent Comedian Mr. Robb and the circus artistry of Ian Faraonel to present a dynamic evening of thrilling magic and illusions, laugh-out-loud comedy, and wondrous feats of the human body. The show also features Guam&apos;s only white lion, Rio! Since its debut last October, the show has captivated audiences and has already racked up an average 5-star rating on TripAdvisor! The combination of acts in the show is a perfect balance of intense illusion, comedy relief and entertaining stunts, but it&apos;s not a show without music & lights! The state-of-the-art theater is the perfect size for both the audience and the performers. There is a lot of crowd participation incorporated in the show, which creates an atmosphere that makes you feel like everyone in the theater - including yourself - are all part of the magic. The size of the theater, along with the fact that only drinks and light snacks are being served, ensures that all focus is directed on the performance. All of the performances are family-friendly and appropriate for all ages. You can easily pair the amazing Encore! Where the Magic Happens show with any one of Guam&apos;s best dinner options. Welcome to the world of Nabil Murday, producer and star of Magic Rocks at Westin Resort Guam. Magic Rocks is an unforgettable dining and show experience that is available as a Show Only option or together with dinner at Prego restaurant or Taste buffet. After enjoying a savory meal with beautiful sunset views of Tumon Bay, guests are brought next door to the Magic Rocks Theater. 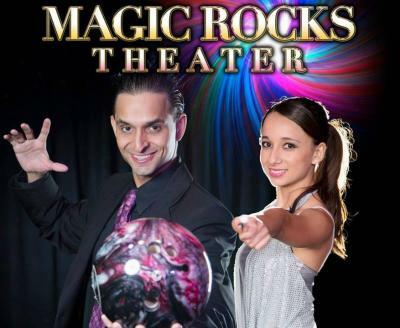 Magic Rocks Theater is an intimate 37-seat theater, where every seat gets a close-up view of the astonishing illusions and magic of Nabil and his lovely assistant. The show is family friendly, with opportunities to participate in some of the acts and picture taking with Nabil after the show.